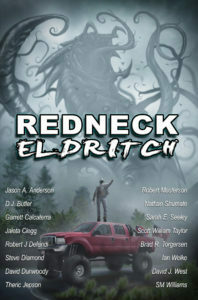 Today’s Redneck Eldritch Teaser is Blood, by Steve Diamond. It starts off even more horrifyingly than most, so enjoy! Today’s Redneck Eldritch teaser is for the funny one, Jaleta Clegg’s A Brown and Dismal Horror. Enjoy! Today’s Redneck Eldritch teaser is Slicker, by Robert J Defendi. Enjoy! So, yeah, I got busy, but here’s yesterday’s Redneck Eldritch teaser – Lake Town, by Garrett Calcaterra. Enjoy! Comments Off on It’s Wednesday! Today, we have People of the Other Book, by Robert Masterson, a delightfully creepy tale, in my humble opinion.